Travelista Club Review: Is it legit? The following is a review of my experience writing for Travelista Club, which operates under Writers.Academy. I first came across Travelista Club about six months ago. Since then, I have bought myself a domain, built up my own blog and started to develop a well-rounded portfolio of published articles all through the platform. Currently, I am actively using the website, getting occasional paid work and am learning more about freelance writing as I go. But there is still one aspect of the setup that I am somewhat hesitant about. The first question people new to Travelista Club ask is, “Is this legit?” But what I think they actually mean is, “Will I really get paid for the articles that I write?” Yes, you definitely do. I am more than happy to vouch for this. But when it comes to a deeper understanding of exactly what you’re writing and how your work generates profits, Travelista Club slides into a rather questionable business model. Below I give my account of writing for Travelista Club, highlighting the benefits and discussing some of the potential drawbacks. Payment happens exactly as the website describes. The first article you write as a new freelancer for Travelista Club will be a 1000-word travel guide for a destination of your choice. You will also need to provide photos. I wrote about the Transit & Stay Cultural Programme at the international airport for Tokyo in Narita, Japan. The first Friday following its publication, I received AU$40 into my PayPal account. 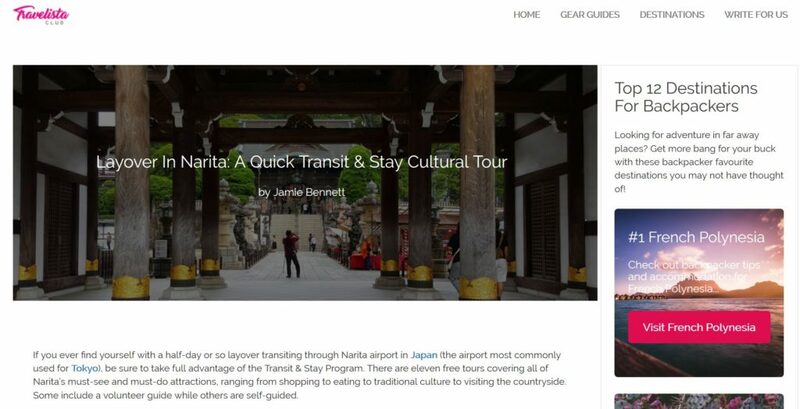 Screenshot of my article published on Travelista Club. As a freelancer, being paid in full and on time is a major concern. In this regard, Travelista Club is completely trustworthy. I have been paid promptly into my PayPal account on the Friday following the publication of each of my subsequent writing pieces. No fussing around and no missing or delayed payments at all. That said, the rate of pay is very low. But I am willing to accept it for the time being. What is the rate of pay? There’s no denying it: Travelista Club’s rate of $40 for 1000 words is low. To be honest, I am not sure if it gets any better. Since my first article, I have only received offers to write 500-word articles and blog posts for AU$20 each. However, at this stage of my online freelance writing career, I choose to look at it as paid work experience. Also, the website is more than just an agent hooking me up with paid writing jobs. (Although, whether the website even operates as an agent at all is something I am not yet certain of, which I explain in detail further down.) Alongside offering paid writing jobs, it provides an in-depth training platform. Here you learn all about the art of freelance writing. This includes the finer points of setting up a personal blog and using it as a marketing tool to get clients. In my opinion, this aspect of Travelista Club offsets the low rate of pay, at least for the first few months. Just some of the available areas of study on Writers.Academy. What are the requirements for getting work through Travelista Club? In short, there are three requirements to write for Travelista Club. First, you need to verify yourself as a real person through logging in via social media. Second, you must have your own blog that is not hosted on a free domain. (Just like Written in Paradise.) You must submit this for review before you can move on to the next step. Third, you have to follow their style guide and successfully submit your first article. After that, you will be listed as a writer on their website and will be eligible to receive offers for more paid work. However, this point needs some clarification. The three steps you need to complete to become a writer through Travelista Club. You won’t actually be getting work through Travelista Club, and, as I’ve found, the articles you will be offered to write probably won’t be travel related. Travelista Club is one of many websites that comes under the umbrella of Writers.Academy. (Not to be confused with Writers.Agency, which is where people seeking to hire writers should visit instead.) It’s essentially a portal into the freelance writing platform that registers your area of interest or expertise. For example, if you’re more into technology, you would sign up via Tech.WTF, whereas if you love all things health and medicine, you would go through Nupathe. So when you first sign up, you register through your preferred topic (see below for a comprehensive list) to write and publish your first article. After that, you won’t be restricted to any one topic or theme. Rather, you will be invited to write on a diverse range of topics via emails sent from the Writers.Academy team. Do I need to pay anything to join Writers.Academy? The only cost involved is the price of buying your own website. It’s not very much and the payment doesn’t even go directly to Writers.Academy. It’s actually more of an investment in your own writing career/side hustle than a fee for signing up. I think I paid US$12 for 12-months for this domain, which is dirt cheap. As mentioned above, you will need your own blog to join and you need to own the domain. To help you with this, Writers.Academy provides a link to an exceptionally cheap deal. They help you to buy your chosen domain and get WordPress hosting through GoDaddy.com. They also include a step-by-step guide for the entire process, so it’s super easy. If you already have your own free blog, there are guides to help you transfer it over to a paid domain with hosting. And if you already have your own blog with a paid domain, you can apply using that so there would be no need to pay at all. Once your domain is verified by the Writers.Academy team you will be able to complete your first assignment. As mentioned above, if you sign up with Travelista Club, you will write a 1000-word travel guide and get paid AU$40. At the time when I joined, this payment was more than the cost of buying my domain and hosting. So right from the start I was in the black with only a very minimal initial investment. Am I guaranteed more work after my first article? Honestly, it took almost two months before I received my first offer for more work through Writers.Academy. Since then I get offers rather inconsistently, but at least I still do get them. Although there is never any guarantee, especially as a freelancer, if you follow the training, you should be able to get at least few offers for additional paid writing jobs. To improve your chances of getting work, you need to rise up the ranks. Thankfully, Writers.Academy is quite transparent over how they rank and promote their writers. They take into account two main factors: first, the quality of your personal website and second, your average number of readers. Using these measures, each writer is given a ranking on Writers.Agency, the sister-site, where clients are presented with higher ranking writers first. In theory, the better your ranking, the more likely you are to get work. With just a few blog posts, all of which followed Writers.Academy’s suggested format, my website quickly got an A grade. However, my average number of readers is still considered low. I must admit, that’s my own fault for not better marketing my articles. Here you can see my ranking on Writers.Academy. Despite my positive experience, I still have a few reservations about Writers.Academy. My main issues have to do with their business model and the legitimacy of the writing assignments. After signing up and processing a lot of information, I discovered that Writers.Academy’s main business is not sourcing and allocating freelance writing gigs, which is what I had originally thought. As they explain, what they really do is provide all-inclusive web development packages. They manage everything “from hosting to web development, social media and search engine optimization.” So, in fact, they are really a web developer rather than an agent for freelance writers. This should have come as no surprise. After re-reading much of the information accessible only after signing up, I realised Writers.Academy had been relatively upfront about this, although not entirely explicit. They justify assigning paid writing jobs for their own websites because after they publish them, they can track the average number of readers. This is simply not possible if they don’t own the website. They are then able to better rank and market writers to outside clients. Although, I am not so sure there are very many external clients using Writers.Agency to find freelance writers, if any. As stated by Writers.Academy, this is not their main focus. Exactly how many external clients they have for copywriting is unclear. Why does Writers.Academy hire writers? To sum up their business, Writers.Academy hires its own writers to build content for its own websites and then encourages these writers to link back to these websites via their own blogs. The writers are rewarded with a small monetary sum, a link back to their own website to help improve their own ranking, plus free training. 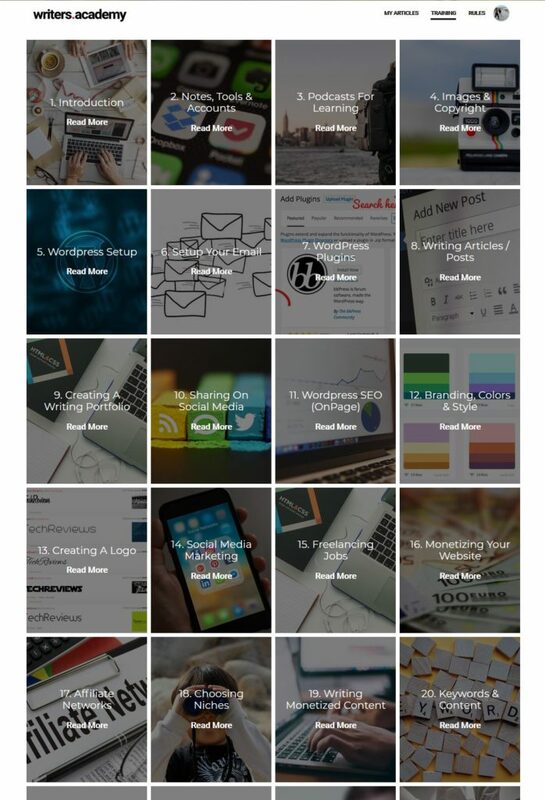 This creates a huge collection of blogs all linking with one another. And the more writers participating and building links, the better. The reason behind developing this enormous series of intricately linked blogs, known as a Private Blog Network (PBN), is that the Writers.Academy websites gain credibility. With more content and direct links being added daily, these sites can consequently move up Google’s rankings and drive more traffic. From how I understand it, in a traditional PBN, this would return a profit through views of paid advertisements on the websites. And the higher up on Google searches a website is, the more visits it gets. However, Writers.Academy doesn’t put adverts on its websites. Instead, they aim to make their websites profitable through affiliate marketing. I guess they get commission every time someone clicks through to the page of the product or service being reviewed, or maybe they get paid if someone buys it. Writers are also encouraged to share their published articles as widely as possible to increase their average number of readers, improve their ranking on Writers.Agency and thereby gain more work. Having the writers do the majority of the marketing work as they spam their friends, family and forums with their promotional articles drastically decreases Writers.Academy’s marketing costs and, at the same time, should also increase their revenue as more people view the product pages and buy the items. Moreover, writers are actively encouraged to recruit additional writers to the network. Full disclosure: we get a few dollars if you sign up via our referral links. I assume Writers.Academy also gets commission from GoDaddy.com for each referral and that they continue to get commission each time the referred writers renew their domains. Either way, it seems they are using this network to increase their rankings, drive traffic and earn passive income. It’s a very clever business model. As a freelance writer, it’s my job to make content that is engaging and that creates a return for whoever has hired me to write. Of course, I must expect whatever I produce to be used commercially, which includes affiliate marketing. This is perfectly acceptable. The real issue is that the website I have paid for – Written in Paradise – is now part of the Writers.Academy PBN. All the articles I write through Writers.Academy include a writing credit to me plus a direct link to my website, which helps to build up this network but may put me at a disadvantage on Google searches. Google tries to stop PBNs because they consider them to be “thin content”, meaning they are “low quality or shallow pages which do not provide users with much added value.” These sites are then labelled as “search spam” and are penalised in Google searches. 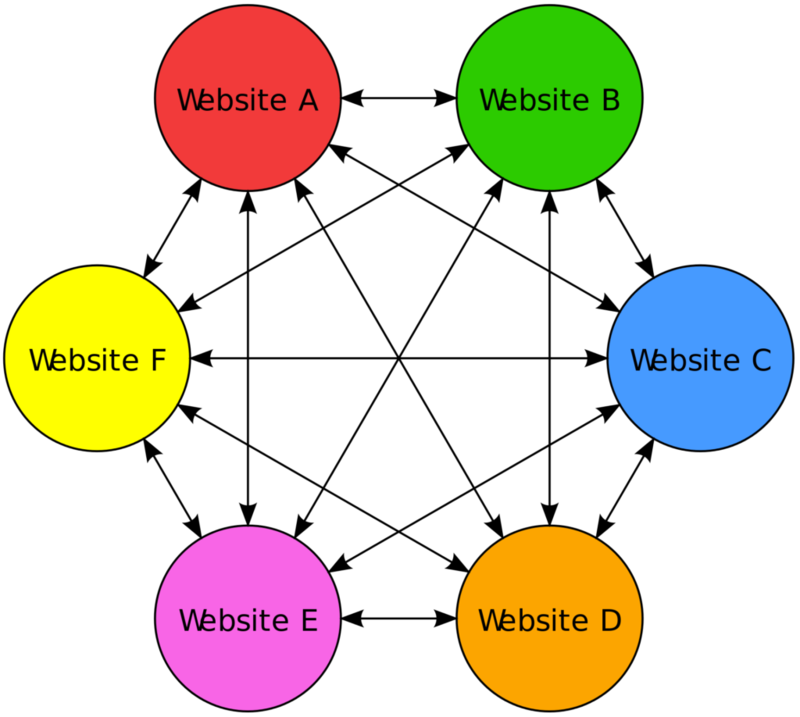 Consequently, any site that is part of a known PBN will struggle to make any kind of ranking, even if the content is legitimate. And this may include my website. I think Writers.Academy has avoided being labelled as a PBN by Google so far because all of us novice freelance writers are providing “valuable” content. The writing tasks I have been assigned all have a minimum of 500 words, and Writers.Academy will not accept my articles if they are a single word less. As such, all of the pages in the PBN look good to Google, so Writers.Academy can avoid being flagged. It’s a well thought out system, but there are no guarantees that things won’t change for the worse in the future. More pertinent to my current situation, I am using these paid gigs from Writers.Academy to develop a broad portfolio of published work. However, potential clients may not take these articles too seriously if they figure out they’re part of a PBN. It may actually completely turn potential clients off hiring me if they realise that my portfolio is based on making fluff to legitimise a PBN. But I guess it’s up to me how I market them and present these examples of my work when pitching to clients outside of Writers.Academy. If you want to start freelance writing but have no idea where to begin, definitely yes. You get a very cheap domain and a detailed guide on how to set up your blog and start your writing business. Plus, you can instantly make back your initial investment if you choose to take on their very first 1000-word writing assignment. If you want to build a portfolio of published work to show to potential clients, I would only say perhaps you should sign up. While you do get published, the fact that it appears to be part of a Private Blog Network reduces its credibility. It may also negatively impact the ranking of your own website as Google tries to stop these kinds of networks from operating. If you are an experienced freelance writer who already has a decent portfolio and established readership, please go ahead and sign up and let me know what kind of job offers you get. I am curious to know if they do in fact offer high profile jobs with matching pay, or if it’s simply a rouse to get more writers on board for their affiliate marketing program. Below is the promised list of websites anyone can use to sign up to Writers.Academy. Simply chose the area that interests you most, click through and follow the prompts. Did you find my review helpful? Any questions? Leave a comment below.